The intention of this article is not to dwell in any way on the actions of the poor gentleman that sadly lost his life, but to assess the behaviour of these onlookers and the horrified responses their behaviour has provoked by offering some historical context. What sprung to mind was the role of the crowd in legitimising public punishment. I should make it clear at this stage, I am not trying to equate suicide with any form of enforced public punishment, but there is historical precedent in the troubling behaviour of the onlookers. A lot of my reading this week has been around the notion of the essential role of the public in c18th and early c19th century punishment. Although, my focus is almost entirely on execution it is important to note that public execution was merely the pinnacle of a diverse range of punitive and public punishments in the state’s arsenal. 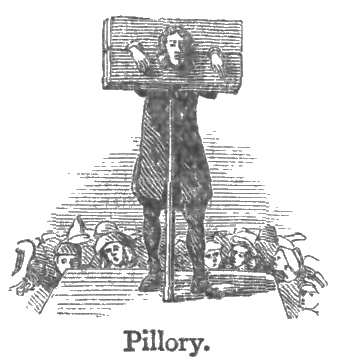 The pillory (see above and below) was one of the more common public punishments and its potency was entirely reliant on the attendant crowd. 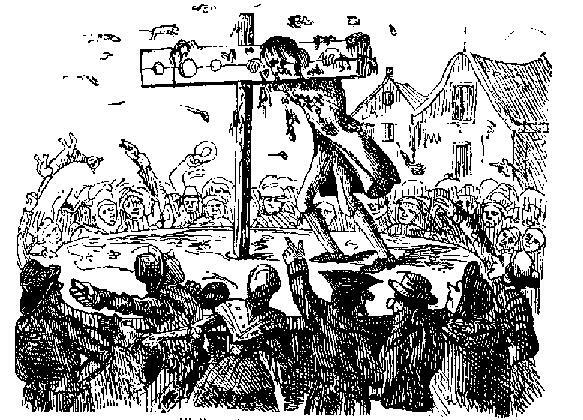 The crowd had a positive role to play at the pillory; under the watchful eye of a Sheriff or other law officer, it was authorised to pelt the offender with fruit, vegetables, eggs dung and so forth. Morgan and Rushton, in their work on the North East, posit that public witness and participation in such rituals were essential parts of their success. That this was a society strongly committed to the idea of public witness of punishment can hardly be doubted….The degrading punishments, actively watched and given approval by the audience, reaffirmed the values of the community. The violence inherent in public punishment was only one part of the intended sentence. Shame played an equal, if not bigger, role still. an important dimension of the punishment was the damage to the offender’s reputation which resulted from public humiliation. In as much as the crowd had a role to play, they played it well. Increasingly too well. Indeed, it was the increasing exuberance of the public in these rituals of violence that made the authorities increasingly anxious. In some instances the pillory, used more often for minor offences, could be a death sentence. Pilloried offenders, to whom the crowd had taken a dislike, were cruelly treated; some lost eyes, some died as a result of their treatment. So we can see clear historical precedent here for this sort of behaviour. Some historians have made the case that these public rituals of violence decreased in the c19th as much because of the publics increasing refusal to play their role, as any overarching ideological move away from open displays of state violence. Londoners of all social classes were simultaneously losing interest in public punishments. As I mentioned in my blog last week, there is a line of academic argument that talks of a ‘civilising process’, coined by Norbert Elias, that has been used to posit that we have increasingly moved away from this sort of public lust for violence as a bi-product of both a burgeoning notion of humanity, brought about in part by enlightenment ideals. A proper debate over this is needed and will, i’m sure be the subject of many future blogs, but at this stage i’ll just say that I find this notion over-simplistic. Not least when events like the one in Telford spring up. One interesting modern anomaly in the story that was reported is the use of mobile phones. Several reports state that the people goading the poor man were also filming the whole thing and taking “selfies” of themselves at the scene. I was reminded of an earlier blog of mine relating to a talk on Mise en Abymes (see image below). 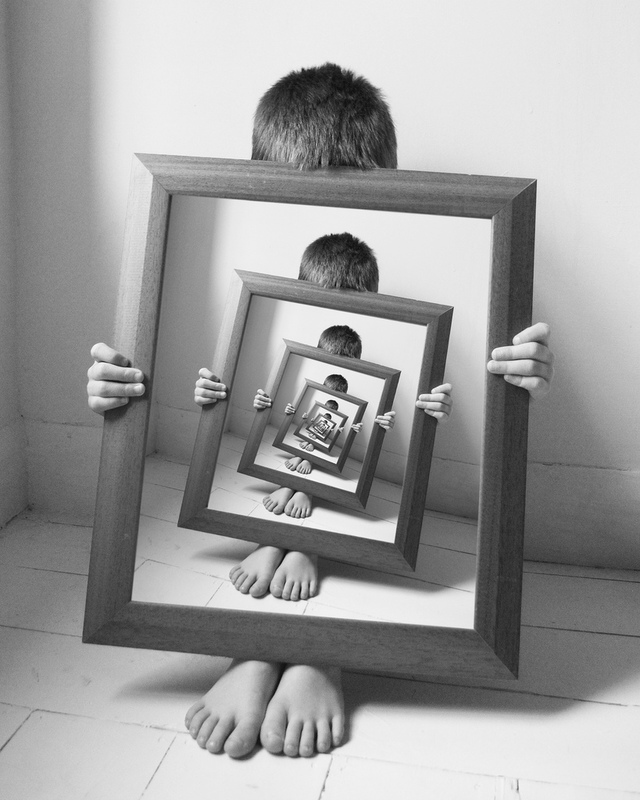 There is a strange sort of refraction that happens with modern technology, whereby people experience something happening through a phone or tablet even though it’s right there in front of their eyes. Go to any gig nowadays and you’re just as likely to have to watch it through someone elses camera as to see it for yourself.This creates the feeling of being at one part removed from the event, much in the same way that watching a video of a terrible thing would perhaps be deemed more acceptable than attending that same event (after all we’re not complicit in the terrible things we see on the news). Perhaps there’s a slight unreality to the situation that alleviates the guilt of participation, but that’s a whole PhD in itself and i have enough on my plate already. Walking home, reflecting on this blog I was listening to A Good Read on Radio 4 and one of the contributors had chosen Robert Louis Stephenson’s Jekyll and Hyde and in their review of the novel, they picked out a quote that I thought perfectly captured the sentiment of this discussion. 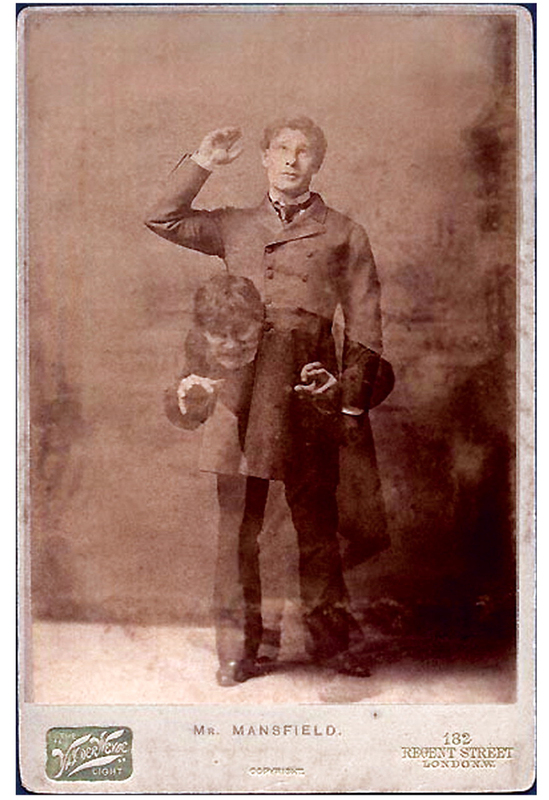 Mansfield’s transformation from gentleman to fiend was so powerful, he was accused of being Jack the Ripper. My impending annual review that I mentioned in last weeks blog has been distraction enough, so I have no musical/televisual/literary recommendations this week. Maybe you can send me some.